In June of 2018, I was invited to Calvert Island by the Hakai Institute to take part in the Hakai Seagrass BioBlitz. The Hakai seagrass surveys, part of an ongoing long-term research project, focus on unravelling subtidal patterns of microbial ecology, with a focus on several ecologically important marine macroalgae and seagrass (Macrocystis, Nereocystis, and Zostera). Sampling was done offshore with divers, and also in surfgrass habitat on the rocky shore. The seagrass biomass provides food, habitat, and nursery areas for numerous adult and juvenile vertebrates and invertebrates. A single acre of seagrass may support thousands of fish, and millions of small invertebrates. Because seagrasses support such high biodiversity, and because of their sensitivity to changes in water quality, they have become recognized as important indicator species that reflect the overall health of coastal ecosystems. During our survey in June, we sampled focal species on various nearshore and intertidal localities around Calvert Island. This work is part of other surveys done at local and regional spatial scales and along the Central Coast in conjunction with the Hakai long-term seagrass and kelp monitoring programs conducted by the Salomon Lab at Simon Fraser University. Our team on the survey comprised experts from the Beaty Museum, Florida Museum of Natural History, Smithsonian, Friday Harbor Labs, and of course, the Royal BC Museum. 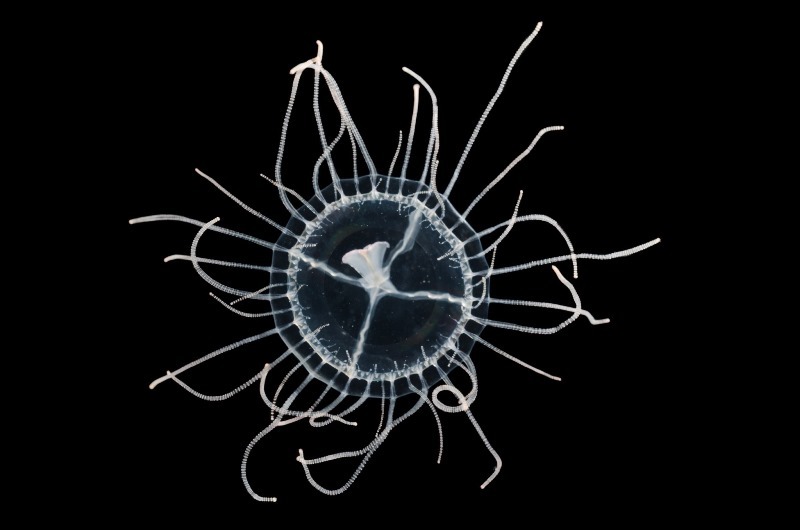 Hydromedusae, Sarsia tubulosa. Photo by Henry Choong. 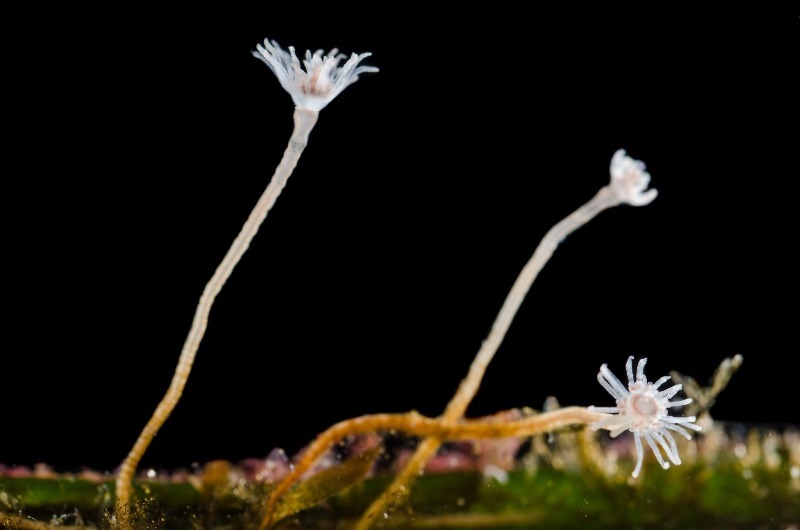 Hydroid photo. Gustav Paulay, Brittany Cummings. 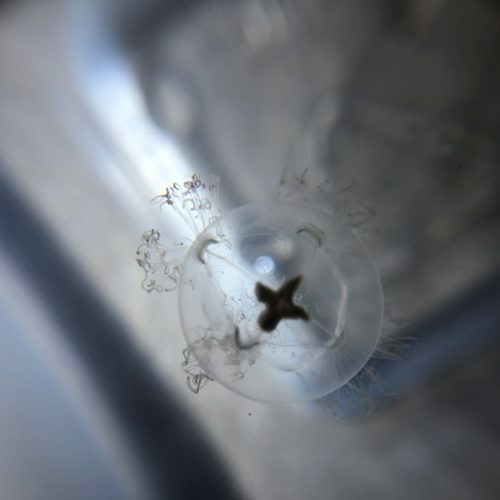 Hydromedusae, Phialella sp. Gustav Paulay. 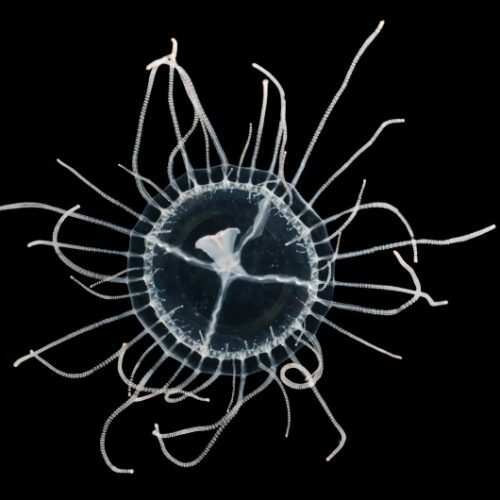 Hydromedusae, Rathkea sp. Photo by Henry Choong. 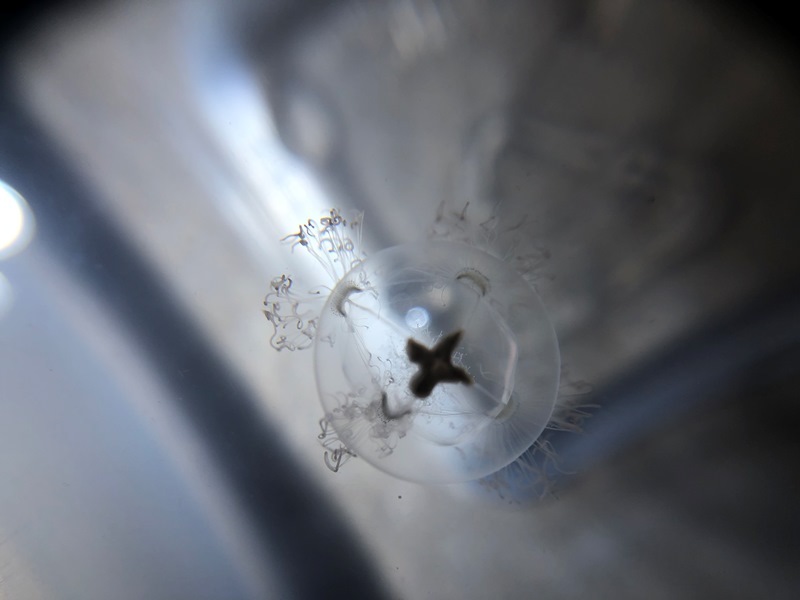 Specimens collected include polychaetes (worms), diatoms, amphipods, hydromedusae (small jellies), and hydroids. 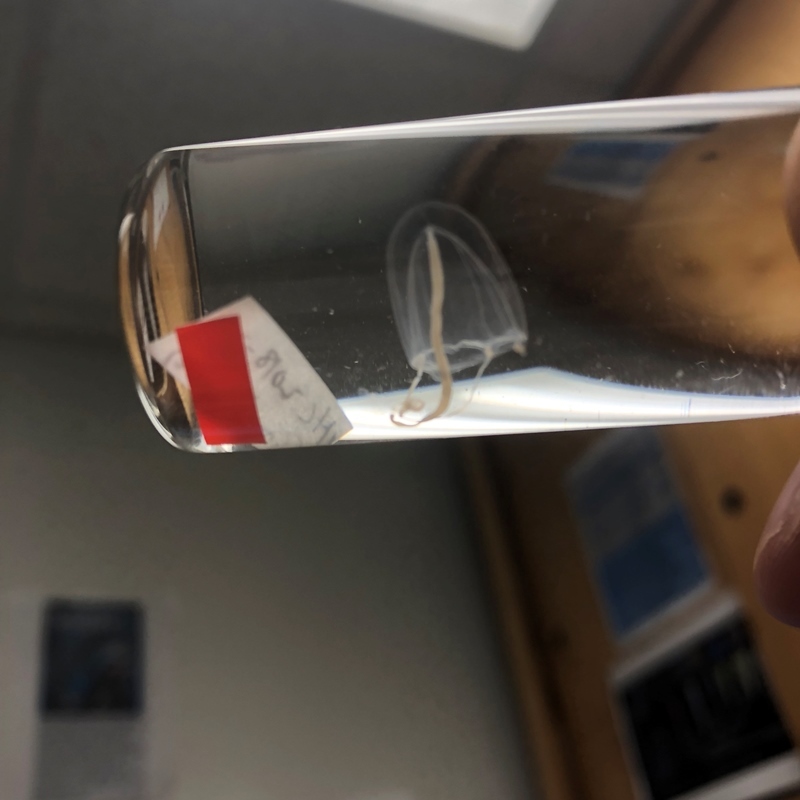 I am a hydrozoan specialist, so my task was identifying and studying the hydrozoans (hydroids and hydromedusae) found living on the seagrass. All specimens were photographed, databased, and sent to be barcoded. The Tula foundation provided the funding for the barcoding through the Barcode of Life Data System-BOLD, University of Guelph. Cnidarian samples (hydroids, etc) will be sent to the Smithsonian for DNA work, as they require different treatment. The Royal BC Museum’s participation reflects the institution’s important role as a member of the larger biodiversity research community- increased taxonomic resolution of the flora and fauna associated with seagrass helps us understand the structure and dynamics of the seagrass habitats. 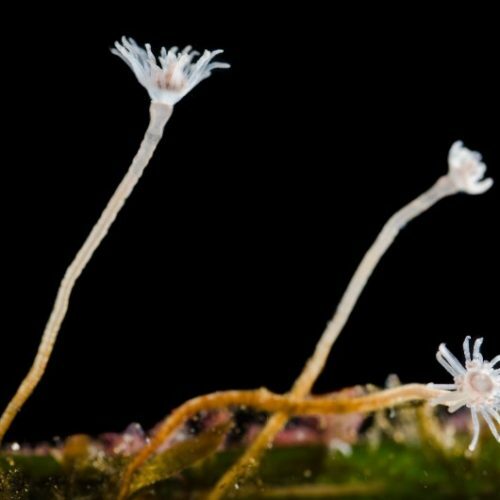 Another goal of this year’s, and other bioblitzs, is to generate an exhaustive field guide to the algae and invertebrates that can be found in seagrass habitats around Calvert Island.